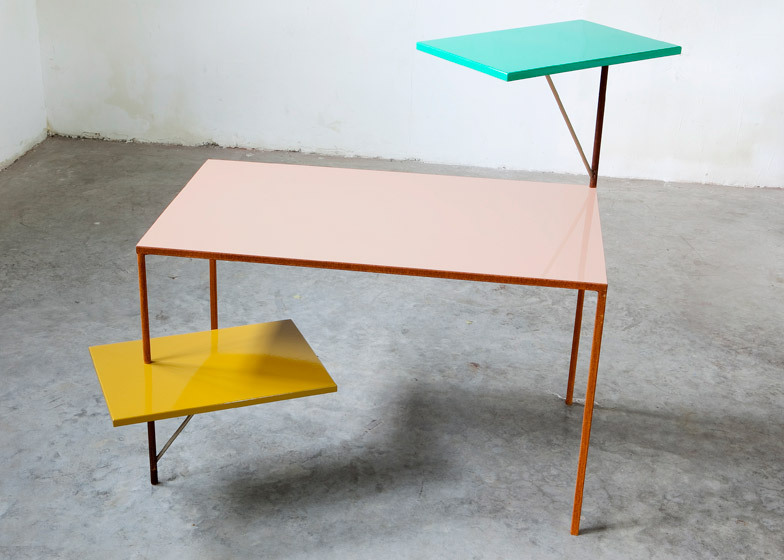 Belgian studio Muller Van Severen will debut its latest pieces of furniture and lighting that "ooze a sort of fruitiness" at London gallery Viaduct next month (+ slideshow). 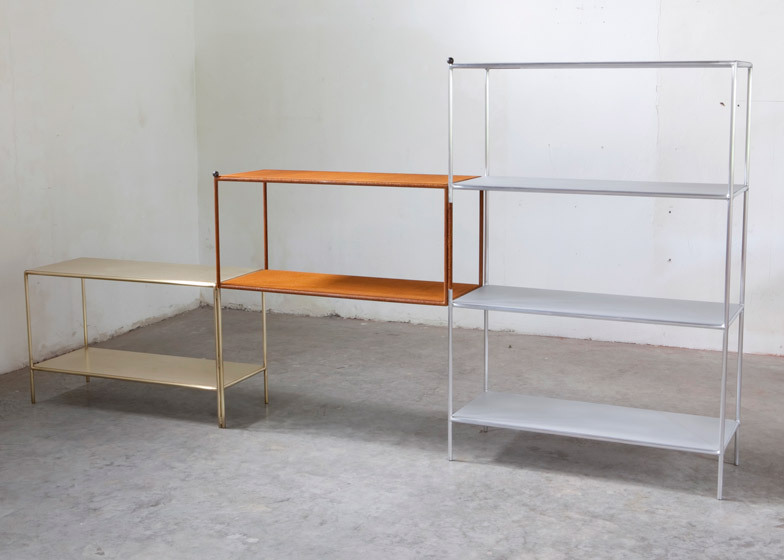 Muller Van Severen's Show 10 collection includes intersecting tables and shelving units that share elements of their rusted steel frames. 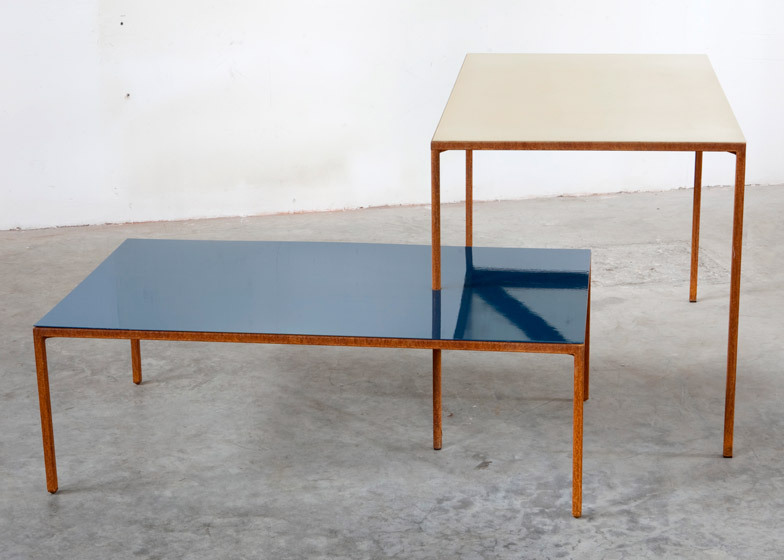 This exhibition is the second solo show at Viaduct by artists Fien Muller and Hannes Van Severen, who have created furniture together since working on a commission for Antwerp's Valerie Traan Gallery in 2011. "Their style is far from harsh but has a distinct geometry that blends curves and angularity with an original use of materials and colour to make compelling combinations," said a statement from Viaduct. 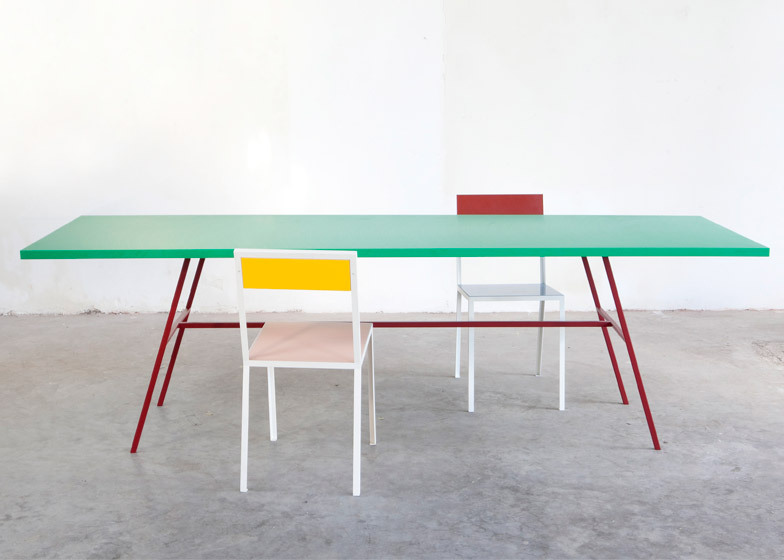 The minimal pieces are accentuated with colourful lacquered surfaces for shelves, tabletops and seats, which can be swapped for marble or terrazzo. 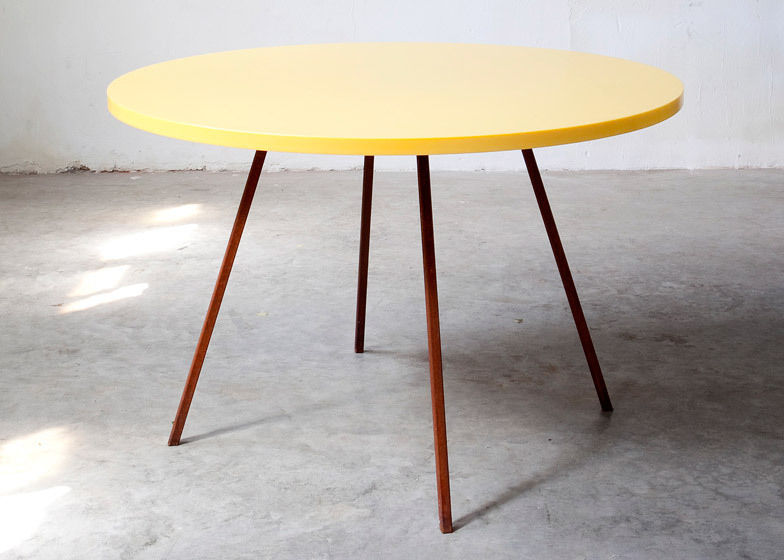 Diagonal brass poles help to support swivelling horizontal planes added to the table legs, both above and below the main top. 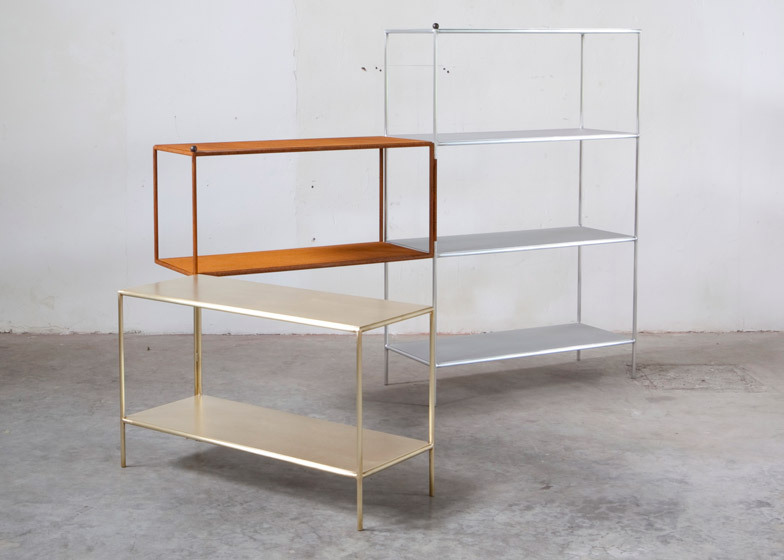 Two simple shelving units in gold and silver coloured metal hold up a rusted unit between them. 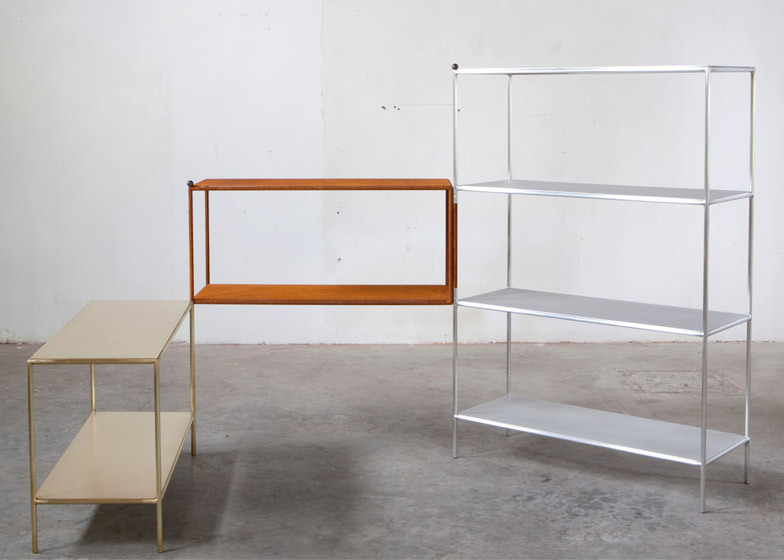 Each of the storage stands can be rotated around the adjoining legs to create different arrangements while the pieces remain connected. A length of thin, flexible tube lighting drapes from the ceiling like a paper chain. 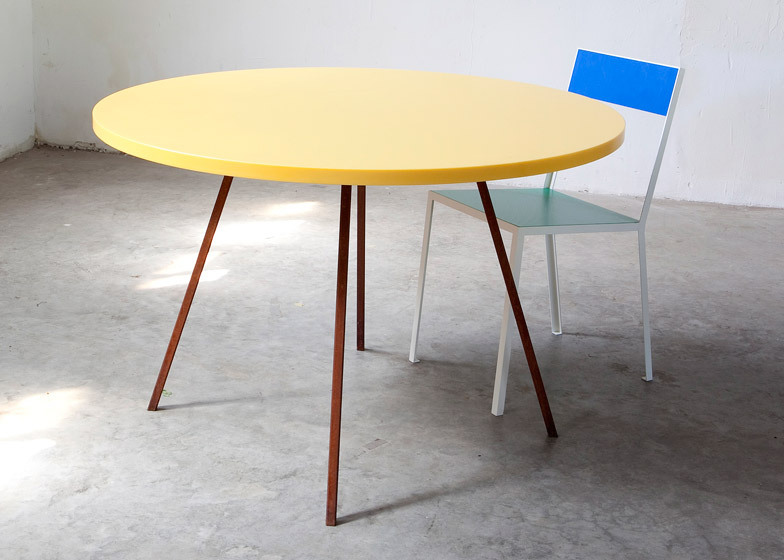 "The term Hybrid Furniture could have been coined with them in mind, for their synthesis of function, shape, material and colour," said the gallery. The exhibition will open on 11 March, when the studio is also set to launch a book about the work, and runs until 28 March. Muller Van Severen previously presented a collection of furniture and lighting that had a similar aesthetic but integrated with a series of soft leather seats at the 2012 Biennale Interieur in Kortrijk.